The onset of summer sees a new design for OUTCROP! Find out more about the work of the Avon RIGS Group and how you can get involved. Look out for new RIGS of the Month and articles on the fossils and minerals of the Avon region. Finally, for the latest news and updates, you can follow us on Twitter @avonrigs . Accessibility: Park on esplanade near Lido. All public access. Risks: Best accessed on a falling tide as tides can reach base of cliff. Slippery rocks in tidal areas, steep slopes on Battery Point. At the Southern end of the sea wall, cliffs of the Upper Old Red Sandstone (ORS) (including and including the Woodhill Bay fish beds) are well exposed. This is the Portishead formation which dips at low angles to the North. 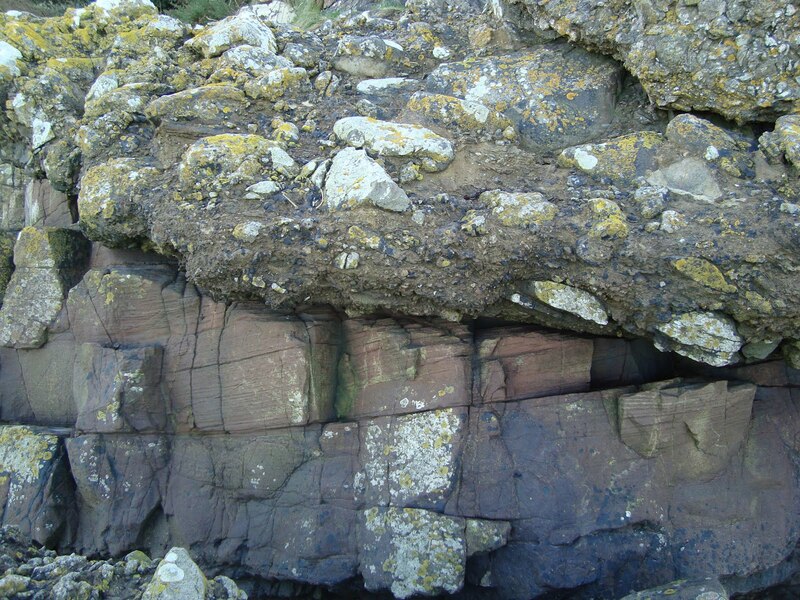 This means that the rocks get progressively older to the South, eventually changing into the Black Nore Sandstones (BNS) of the Lower Old Red Sandstones which continue to be exposed as far to the South as Charlecombe Bay. 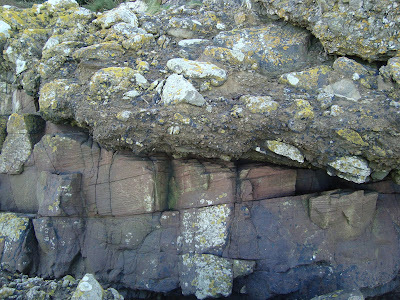 The total thickness of the ORS in this area is thought to be 900 – 1200 m.
The Woodhill Bay fish bed formation consists of sandy siltstones and sandstones where beds vary in thickness between 0.5 m and 3 m. Many fish have been discovered here in the past and fish scales can still be found. 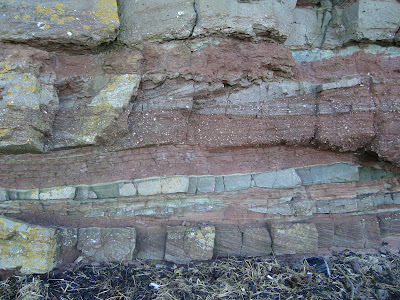 Two post-Triassic faults can be seen, with the Triassic conglomerate being down thrown with respect to the Devonian strata forming a graben between them. A discontinuous cover of Triassic Dolomitic Conglomerate blankets the ORS strata and, in places, excellent examples of angular unconformity are present. Calcrete can been seen in the Lower Devonian cliff exposures of BNS. This calcrete formation is known in the South Pembrokeshire area as the Chapel Point Calcrete. It extends across South Wales and can be seen on the shore cliffs of the Severn at Lydney, where it is known as the Bishop’s Frome Limestone. For more info on this topic, click here. - Savage R.J.G. 1977. Geological Excursions in the Bristol District. - Barclay W.J. 2005. Introduction to the Old Red Sandstone of Great Britain (GCR) Chapter 1. - BGS. 1968 Geological Sheet ST 47 Clevedon and Portishead. - BGS. 2004 England and Wales Sheet 264 Bristol.